It’s just about Mardi Gras time and we wanted to make some more green, gold, and purple slime that brought in some of our celebration here on the Gulf Coast to everyone else out there that do not get the parades and moon pies. Have no fear, you can still celebrate like you are in the south with this Mardi Gras Beignet recipe, Mardi Gras Cookie Dough recipe, DIY Beaded Statement Necklace, or even your own customized Mardi Gras Mask! 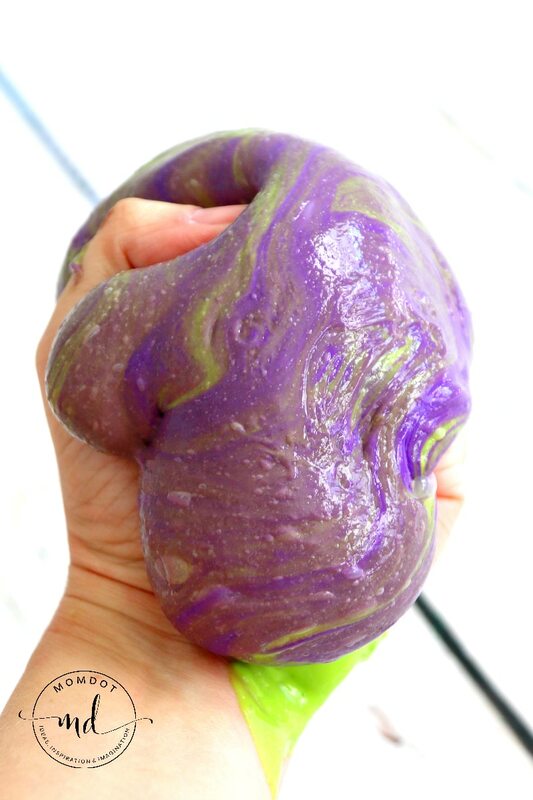 Now that you have all your fun in place, it’s time to get ooey, gooey and sticky with Mardi Gras slime- without borax. PRO TIP: Making slime with LIQUID STARCH and glue is a ton easier than mixing borax to do it. Simply use about 1/3rd cup starch in 1/2 cup glue (you can stir in some food coloring or paint to color before you add) and then add starch little by little until you get the slime consistency you want. We use red solo cups to do this and once it’s mostly sticky, we pull out of the cup and start to mix with our hands. If the slime is still sticky, that means you need more liquid starch. 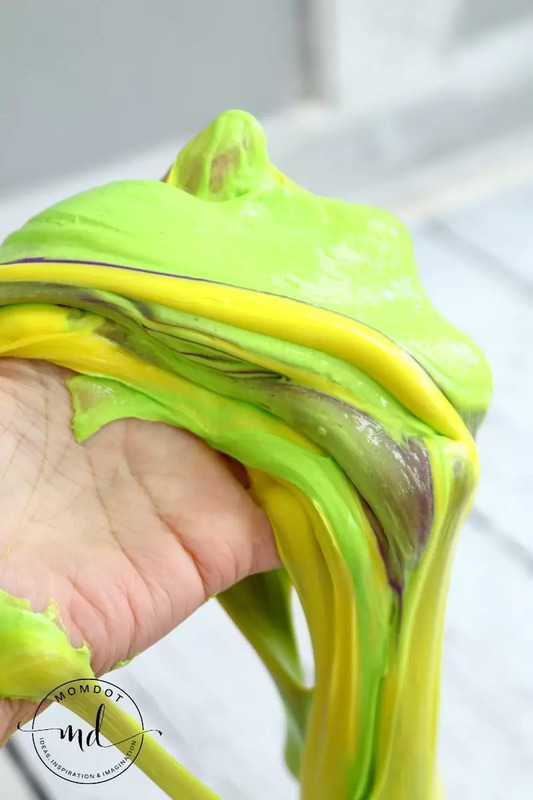 As the slime starts to get perfect, it will not stick to your hands anymore. Keep kneading it as it starts to peel off your hands and it will be perfect. 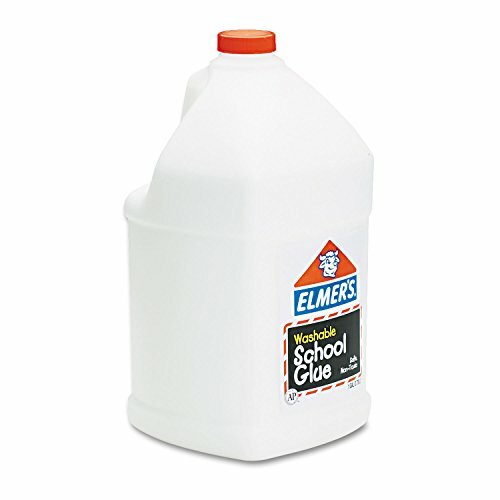 Depending on how much glue we pour, it usually tends to be about a half a cup overall. Scroll down to see a video on the process. 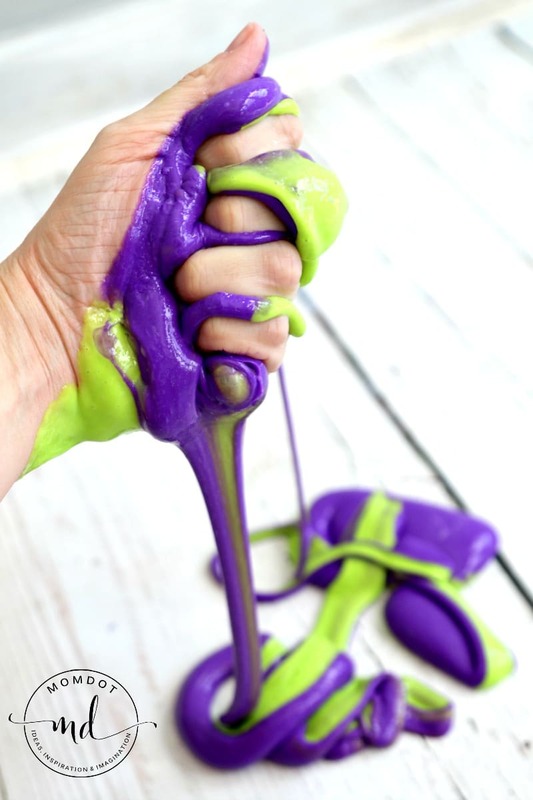 Mix your Liquid Starch, Glue, and Tempera paint (you can also use food coloring) together in several batches- carving out a purple, green, and yellow slime ball. Lay each slime on top of each other in a stack (like a pancake) and roll together so one slime is on the outside and the other two are on the inside. Pick up and let the slime drip down and the colors will start to appear! Your kids will enjoy squeezing it and watching all the stripes start to appear. 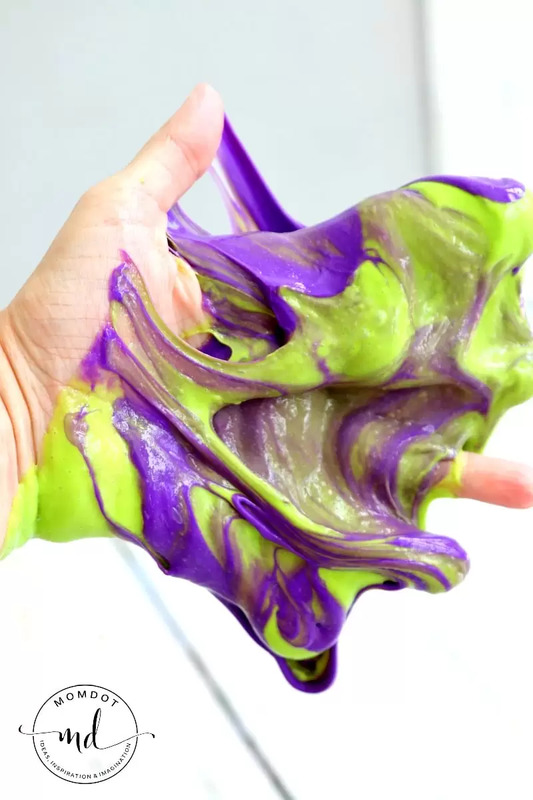 This Mardi Gras slime is SO FUN to play with, but keep in mind that these three colors mixed together eventually turn into a sorta of puke green. It’s still tons of fun until then. You can’t see it yet, but the purple is in the middle and waiting to come out! 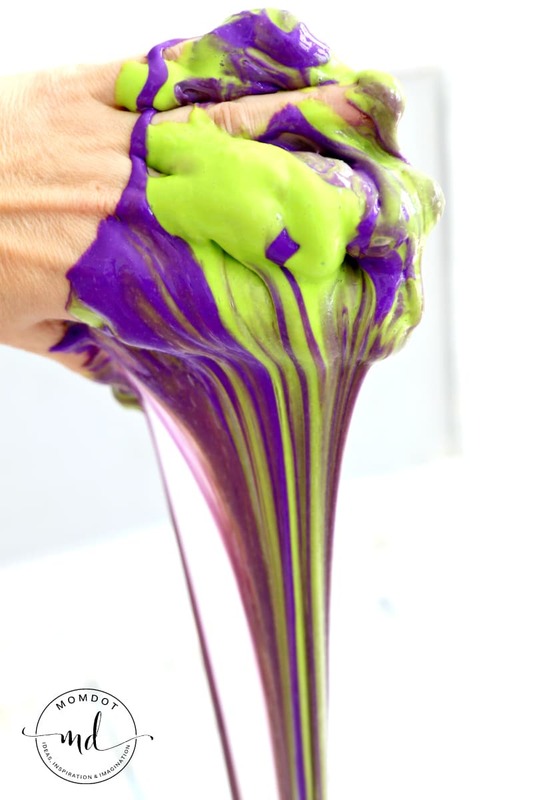 Then we remade our mardi gras slime with just green and purple! After the colors combine a bit with some play, it gets solid. So many people message me and ask me how I get slime so perfect…..well, it goes through stages and some people quit before they get to the slimy stage! I did a video showing you what you can expect when you create your slime. It’s a lot easier than you think. Yes, there are two ads in this video near the beginning, which help pay for all this slime recipes and ideas that are provided here and we appreciate your support in keeping those costs down. 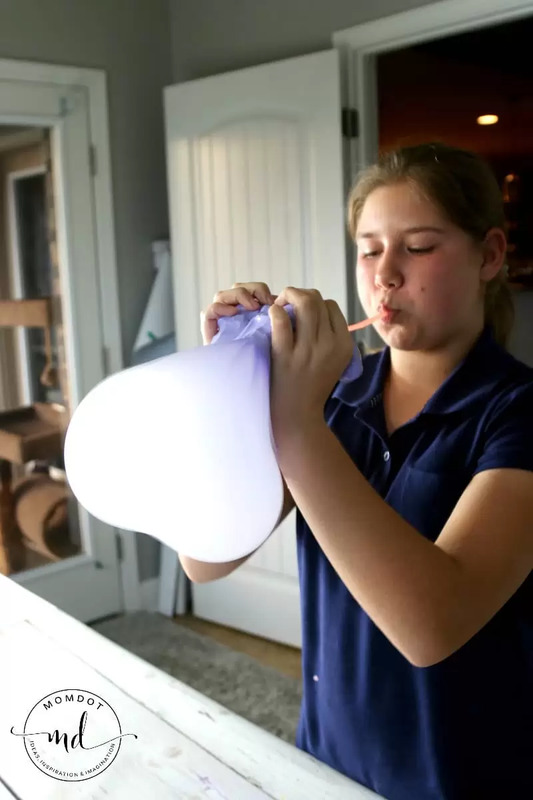 Last but not least, Charlotte shared a How To Make Slime Bubbles tutorial here. This can be used with any slime recipe, so please pop over and see it before you go! « 10 Brilliant DIY Home Decor Ideas To Makeover Your Home!